So I was checking twitter and glanced at the ‘Now Trending’ column. It being a European football night, most of the current trends were footie related, “Liverpool”, “Suarez”, “Zenit” and so on. But right at the top of the Irish trends was the hash tag #BieberToCrokePark. And it sparked a moment of extreme cognitive dissonance. After a couple of seconds it became apparent that the tag was a manifestation of the demands of Irish Justin Bieber fans that the teen popstar play a concert at Croke Park – Ireland’s largest stadium and concert venue. However, Croke Park is also the location of the conference centre used by the government when negotiating with the public sector unions. This is why the terms and conditions under which public sector workers are employed are collectively known as “The Croke Park Agreement”. And because The Croke Park Agreement is currently being renegotiated (recast for our Austere Age), it’s in the news almost constantly these days. Hardly a day goes by without a headline including the words “Croke Park Agreement”. Whether it’s Garda representatives walking out of negotiations and refusing to re-engage until pay cuts are taken off the table, or the Health Service Unions expressing “deep misgivings” about the Croke Park Agreement. If you don’t live in Ireland you’ve probably never heard the phrase. If you do live in Ireland, you hear it all the time. 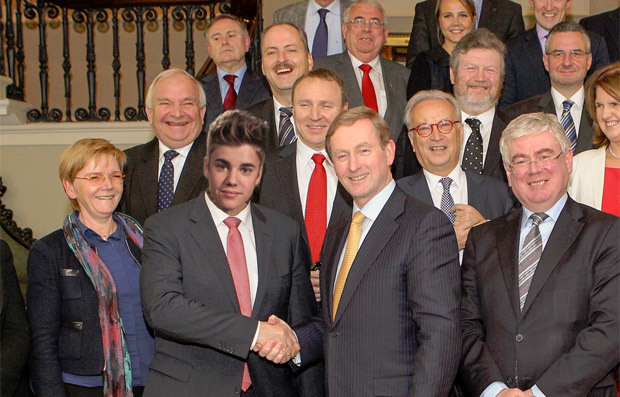 Which is why the first thing that crossed my mind when I saw #BieberToCrokePark was “Whoa… will he be negotiating on behalf of the government or the unions?” The second thing that crossed my mind was “WHAT!!!??? What does that even mean? !” Thankfully though, the thought “hang on, it’s probably about him performing, isn’t it?” arrived just in time to prevent my brain from exploding.